The holidays will be here before you know it. If your budget isn’t quite ready for all those extra expenses, I’ve got just the ticket for you! 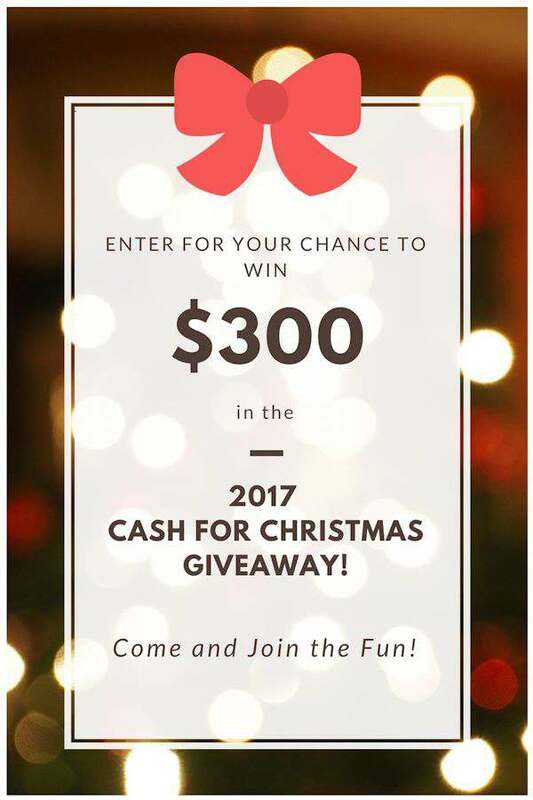 I’m excited to join with a great group of bloggers this season for another fabulous CASH giveaway! I do most of my shopping before Thanksgiving if possible. I don’t like to stress about it, so earlier is better for me! I do most of my Christmas shopping before Thanksgiving. Christmas shopping all done and wrapped well before Thanksgiving. It depends on how much money I have I like to shop before Thanksgiving if I can. I do most of my shopping after Thanksgiving, but soon after. I do most before Thanksgiving, but then there’s always that mad rush a few days before for ones I hadn’t remembered or for things that I hadn’t been able to get before. I’m super impressed with all of you who do your Christmas shopping BEFORE Thanksgiving! I do some on and off through the year but probably the majority after Thanksgiving. I do most of the shopping before Thanksgiving and just a few last minute things after. I start on Black Friday!! I do the majority of my shopping before Thanksgiving – well maybe a little over half of it usually. I like Black Friday too. I usually do my Christmas shopping after thanksgiving. Thanks Kim! I’ll let the giveaway organizer know. Im normally shopping well before since everyone also has birthdays between october and january in my family. this year i haven’t shopped at all. i am so behind. I usually spread my Christmas shopping out all year. I do about half before, and the rest after. I like to do my shopping throughout the year so that it’s not so overwhelming and I don’t have to fight the holiday crowds last minute! Do you do most of your Christmas shopping before or after Thanksgiving? I Actually do all of mine before Thanksgiving and shop all year. Some things I can pick up right after Christmas (like gif baskets for my nieces) and save them for the coming year.Now and again, if there is a super good buy on Cyber Monday I might pick up something, but rarely. Most the time I am in a rush doing it at the last minute before Christmas..